SCVHistory.com LW2710 | William S. Hart | 'The Narrow Trail,' Original Publicity Still No. A13-6, 1917. Original 7.5x9.5-inch glossy publicity photograph (probably cut from 8x10) showing William S. Hart as Ice Harding in "The Narrow Trail" (1917). Still No. A13-6. This print is from the Culver Pictures archive and encapsulated by CGC with a grade of "good" (which means relatively bad). See back of photograph below. 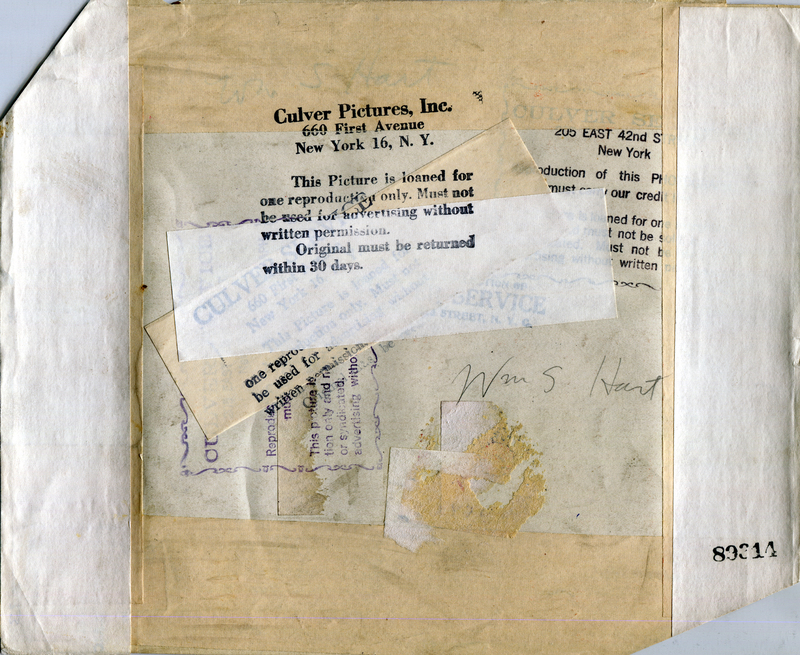 Founded in New York in 1926, Culver Pictures collected publicity stills and other types of photographs and sold copies to publishing companies (and, as in this instance, apparently rented them out with the proviso that they be returned). 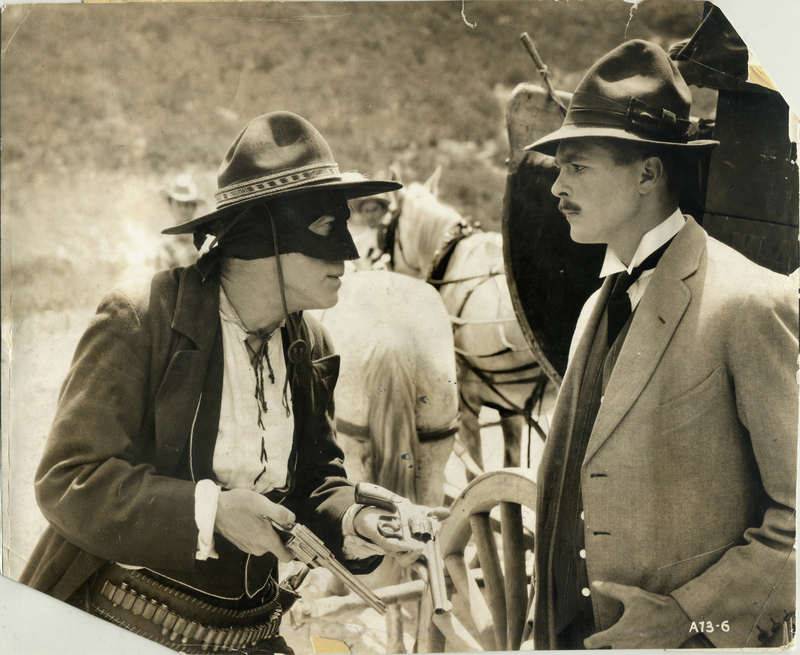 Considering the dates, Culver probably provided copies of this image to publishers promoting re-releases of the film or needing "generic" Two-Gun Bill. Today (2014), Culver provides digital images to customers; it has sold off tens of thousands of original prints in recent years. Zukor was the mastermind who turned Famous Players-Lasky and its successor, Paramount, into a monopolistic distribution empire that controlled everything from production to exhibition in company-owned movie houses, and forced independents to rent lousy pictures if they wanted to show the good ones. The scheme was eventually busted up by the feds (and it's why studios can't own movie theaters today), but that came later. For now, what it meant for Hart was bigger budgets, wider distribution and higher salaries. looked ridiculous astride the small pony. Adolph Zukor remembered that "Bill's feet almost touched the ground" when he rode the little pinto, and Zukor admitted that there was criticism of "so big a man on so little a horse." Some of the Hollywood cowboys said that Hart preferred riding the pony because he was afraid of horses, but the mawkish star responded that a westerner's love for his horse amounted "to a religion" (Davis 2003:90). Ince forced Hart to ride a more appropriately sized mount in "The Silent Man," to Hart's chagrin (ibid:115). Nonetheless, when "The Narrow Trail" was released at the end of 1917, Hart made personal appearances with Fritz to promote the picture, and "most critics agreed that it was one of the actor's best. ... Advertisements for the movie proclaimed: 'Better a painted pony than a painted woman'" (ibid:114). The woman, incidentally, was Sylvia Breamer, who also played in "The Cold Deck" (1917), Hart's last picture for Kay-Bee/Triangle. A newcomer from Australia, she's one of the few leading ladies Hart isn't known to have proposed to. Produced by William S. Hart Productions; advertised as "supervised by Thomas H. Ince"; distributed by Paramount-Artcraft; released December 30, 1917; ©October 3, 1917; five reels. Directed by Lambert Hillyer; screenplay by Harvey F. Thew from a story by William S. Hart; photographed by Joe August. CAST: William S. Hart (Ice Harding); Sylvia Breamer (Betty Werdin); Milton Ross ("Admiral" Bates); Robert Kortman ("Moose"Halloran); Fritz (The King). LW2710a: 19200 dpi jpeg from original photograph purchased 2014 by Leon Worden.